The New Year is a time where a lot of us make the goal of being healthier. It’s only now—when I’m working to be healthier—I realize how hard it is for us to stay on track and make intentional steps to always be healthy each day, especially at (dinner) parties. People will not only shrug when you say that you try to make healthier choices, but they also don’t make the effort to have healthy options during a party. I am making the commitment, here and now, to change that and do my part. 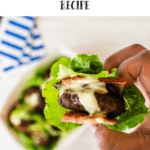 It all starts with this Healthy Mini Burger Bites Recipe. I have a fair share of appetizer recipes here on the blog and I rarely have any healthy choices. 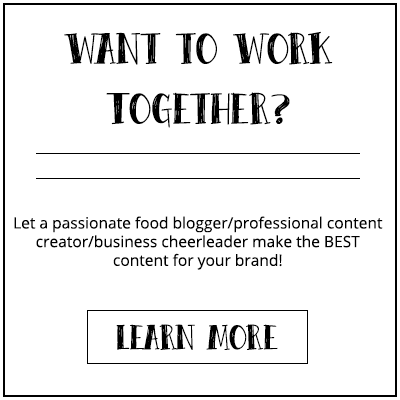 I promise to share at least one healthy recipe each month, whether it’s a healthy appetizer or cocktail. Whatever it is, you and your guests should always have a choice. At the same time, I want to motivate you to have one healthy recipe during your dinner parties, home happy hours, Christmas parties, or whatever you’re celebrating. Make your guests feel comfortable and respected. 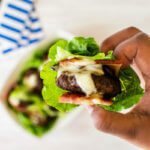 I came across this healthy mini burger bites recipe when I was following a special 30-day diet program by Kym Campbell. She’s the founder of Smart Fertility Choices where she helps ladies with PCOS. 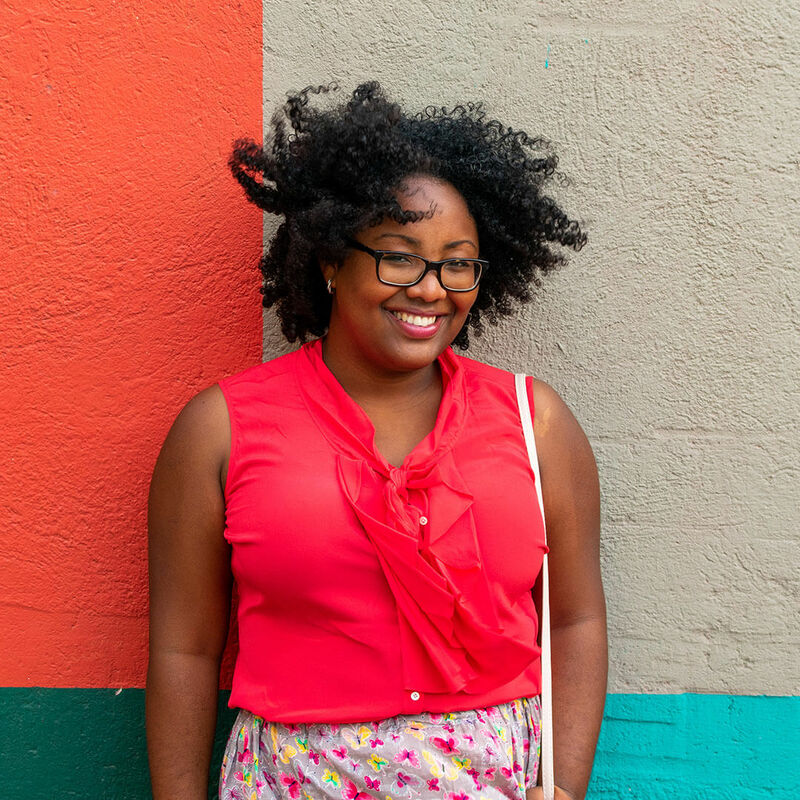 After I got diagnosed with PCOS and started my weight-loss journey, the first thing I stumbled upon was her website. It made me realize how many good and healthy recipes there are out there. It just takes a bit of creativity and mindset switching. 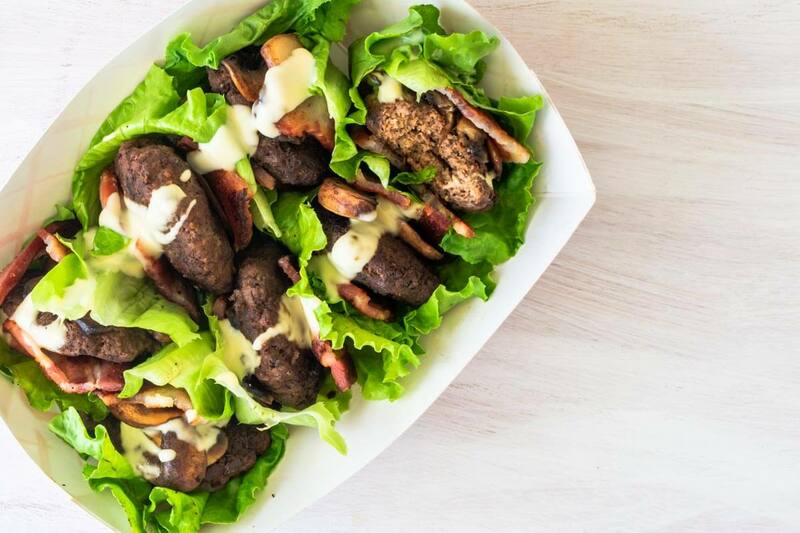 I mean, who would have thought that wrapping a burger in lettuce would create a delicious healthy mini burger bites recipe. A perfect appetizer or party bite/hors-d’oeuvres. I was very skeptical at first, to be honest, but after I gave it a try and added my own touch to it I was sold. I think this healthy mini burger bites recipe will become my new must-have during parties. Now everyone, no matter their diet, can enjoy the evening without feeling like their starving themselves. In one of my next blog posts, I will get deeper into the art of entertaining for different diets. How do you accommodate dietary needs at (dinner) parties without going crazy? 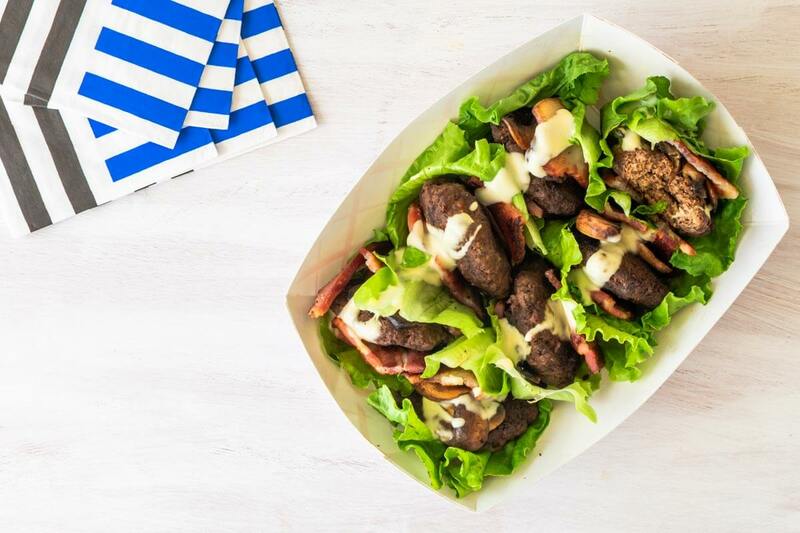 This healthy mini burger bites recipe with bacon, mushrooms, and ranch dressing is a perfect appetizer recipe for your next (dinner) party. In a bowl add the ground beef and the spices. Mix the spices into the ground beef by massaging it with your hands. Make small, but bigger than your desired size, and flat beef patties. In a grill pan fry the bacon slices 5 minutes on each side on medium heat. Transfer them to a plate lined with kitchen towels. Add the mushrooms to the pan and cook them until soft, around 5 minutes. Transfer to a plate. In the same pan add the olive oil. Add the patties and sear them by cooking them on high for around 3-5 minutes on each side. Lower the heat to medium and let further cook for around 5 minutes. Transfer to a plate lined with kitchen towels. Wash and dry the lettuce leaves. Take one leave and fold it into, horizontally. Assemble the burger bites like a taco. 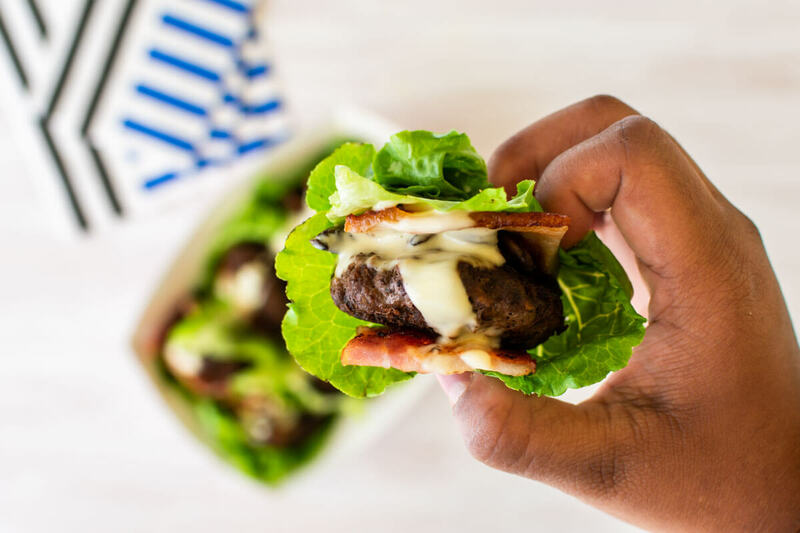 Wrap the bacon around the patty and place them inside the lettuce. Add mushroom and close the burger. Place it on your serving tray with the open side facing up. Repeat for the remaining patties. Drizzle the ranch dressing on top. Use good quality ground beef so you don't have to add eggs and/or breadcrumbs. Find the recipe for the ranch dressing here.